daily timewaster: Just got back from the garden. Should have taken a bigger bowl, there's eggplants I didn't even touch (but tomorrow is another day!).. Just got back from the garden. Should have taken a bigger bowl, there's eggplants I didn't even touch (but tomorrow is another day!).. 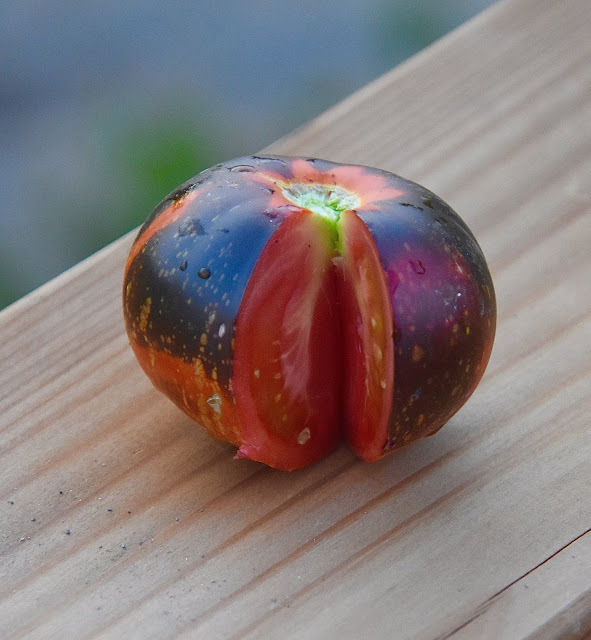 That's a nice looking tomato! A friend gave us some great ones right out of her garden. We stopped & bought bacon on the way home cause a bl&t with fresh tomato is hard to beat! Aaarrgghhh! That's a great idea! Tomorrow. Belgian Tomatoes: (my Grandmother's recipe). Slice fresh tomatoes ~1/4" thick, lay in dish in 1-2 layers. Drizzle with 1-2 tsp gourmet vinegar, sit in fridge for 5-6 hours. Prior to serving: Dice finely 1 small red onion, spread over the top of the tomatoes. Place several small dabs of sour cream on the tomatoes (~1 per slice), add freshly diced flat leaf parsley for flavor & garnish, ground black pepper, salt. Just before serving: Brown 2 tbsp butter in a skillet. Just as it starts turning past lightly browned, drizzle this over the prepared tomatoes and serve immediately. Feast! 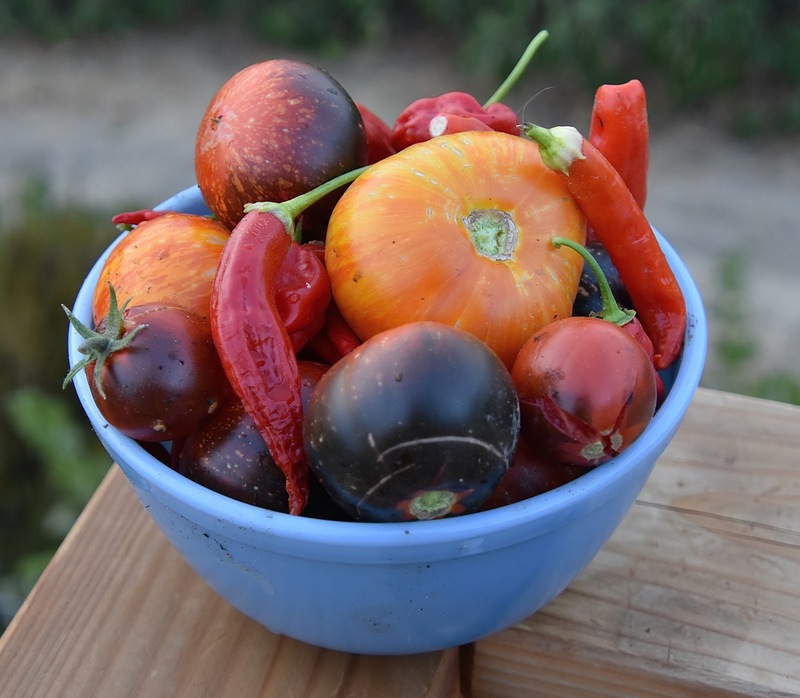 Unbelievable flavors with freshly harvested tomatoes. Thanks! I'll try that for sure. Strange year for the garden. Tomatoes were slow to produce averaging one a week. This past week I got a dozen and it looks like that will be average for the next month. The cucumbers all came in a two week window last month. I now have 6 quarts of pickles. I also have the blandest jalapeño pepper plant that is putting out a couple of peppers a week. I have a Thai pepper plant that has produced 6 peppers so far - stupid hot.